There are few industries that develop at quite the same rate as that of technology. The irresistible march of progress that saw the PC become one of the most incredible feats of the human invention now threatens it’s very existence, as the rise of mobile computing looks as though it could make the traditional desktop computer and laptop obsolete sooner rather than later. It is a debate that has been raging for the last year or so and particularly in the last six months following the release of some statistics that looked concerning for the PC industry. The first of these came in September when the Macquarie Group said that desktop web search had declined by 4% year-on-year – the first time it had fallen since they began tracking such data back in 2006. In addition, the world’s leading IT research and advisory company Gartner released figures showing that in the fourth quarter of 2012 there had been a 4.9% fall in worldwide PC shipments when compared with the final quarter of 2011. Although hardly conclusive, these trends point to two things: we are buying fewer PCs and using them less. What has previously been in the PC’s favor is that mobile devices simply weren’t capable of performing the wide range of complex tasks that desktops were. Smartphones may be great for browsing the internet on the go or using apps, but they are hardly in a position to replace the computer when it comes to creating documents, gaming or the various other complex tasks you can perform with a PC. Equally, tablet computers are incredibly convenient for internet access and consuming content while relaxing on the sofa or on-the-go, but again, are they really a suitable replacement for the PC? Not currently, but rapid improvements in technology could mean that tablet computer, in particular, could soon be just as useful for, say, working on Microsoft Office applications as a desktop computer. The introduction of convertible tablets, such as the HP Envy X2 and Asus Vivo Tab RT, are also showing an awareness from manufacturers that the future of tablets includes more than simply reading books and watching YouTube on a lazy Sunday afternoon. Of course, one place you will still often find a desktop PC is the workplace, and most office workers will still use PCs for the majority of their day-to-day work. The idea of a room full of professionals compiling spreadsheets on a tablet seems fairly ridiculous, but with the rising popularity of Bring Your Own Device (BYOD), employers are beginning to take notice of the changing landscape. A survey conducted by technology blog ReadWrite found that 82% of companies that were asked in 2013 allowed some or all of their workers to use their own devices – and its popularity is growing. It’s easy to see why when you take a look at the various benefits of BYOD which are said to include higher job satisfaction, improved efficiency and productivity and of course, more mobility. It is the mobility that is driving much of BYOD’s rise, as employees are able to work from anywhere when used in conjunction with innovations in cloud computing and hosted desktop. So, is this really the beginning of the end for the humble desktop computer? It is an easy conclusion to draw if you take the decline in PC shipments and the increase in mobile device sales at face value, but of course just because the two happen simultaneously does not mean that one leads to the other. Improvements in computer hardware and software mean that the upgrade cycle that was once 3-4 years is now more like 5-6, with PCs remaining more than capable of running new programs when before an upgrade may have been necessary. When you consider the lifespan of a typical smartphone, currently at 1-2 years for most users, it is logical that their sales would outstrip that of the PC. Last year, 700 million smartphones were sold worldwide compared with 350 million PCs, but given the comparative upgrade cycles this doesn’t seem unusual and, as a consequence, doesn’t really indicate anything profound. At 128 million units sold in 2012, tablet computers were still outstripped by PCs. As the computing industry opens up to incorporate a wider range of tech it is inevitable that the PC’s market share will decrease. However, just as the microwave didn’t replace the oven and the scooter didn’t replace the car, the desktop computer is still a long way from being read its last rites. I think you get a very interesting idea about computer those days. Yes, with the development of technology. we can see the role of computer is underestimated, people can do all the thing on their smartphones. Bu No, computer is getting more convenience day by day to get more suitable for users. More people and businesses are going mobile now but I believe desktop will still have a fair share of the market, especially for avid gamers. While they have shown great performance improvements on the last few years, the mobile devices just don’t have enough power to satisfy dedicated gamers. I am still most comfortable with the traditional desktop no matter how advanced mobile banking may be especially when it comes to office works. Yes, Desktop Computers are in great but still colleges and school are holding to them. Things are changing fast. There are tons of really cool devices are coming. Some of them are partially replacing the functionality of conventional PCs and laptops. Others are completely different in nature but providing awesome capabilities. PCs are getting more compact and powerful, laptops are moving in direction of ultra books tablet pcs. The future of technology is great. The is no doubt about this. Desktop computers will never die and I’m very sure of that. I own 2 high specs laptop before and both died because of over usage unlike my gaming rig desktop that still survives and still kicking out from the heavy tasks that I do from day to day basis. 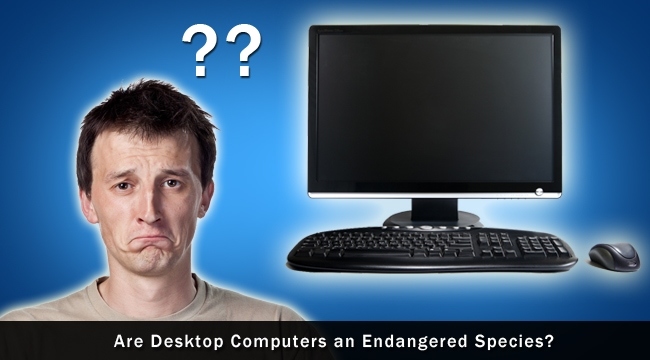 I don’t really see desktops getting replaced in the near future! Although its not portable, it still has a lot more advantages than other forms of computers. No matter how cloud storage gets, or how faster tablets become, for me there are something irritating to do on tablet or smartphone than a desktop. Even a cheapest desktop computer is more productive than an expensive tablet. 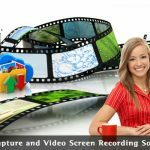 Writing, document editing, video editing, photo workouts, data entry are some of the most essential things, that are hard to achieve without mouse and keyboard. Also the exhaustive tasks makes Tablet and smartphone heat., where as PCs can be cooled and have enough ventilation around them to keep working for days even without shutting down once. I do not thing Desktop thing will end ever!